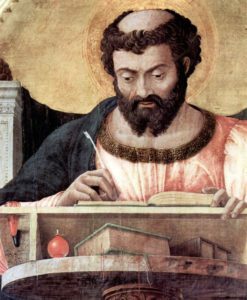 According to the early Church historian Eusebius, Saint Luke was born in Antioch of Syrian or Greek parents in 31 A.D. The earliest Church tradition identifies Luke as the author of the third gospel that bears his name, and the Acts of the Apostles. As one of the first Gentile converts to Christianity, he became a travelling companion of Saint Paul on his many missionary journeys. Even after everyone else had deserted Paul, Luke was with him in his last days and final imprisonment in Rome. What happened to Luke after Paul’s martyrdom is not certain, but according to a fairly early and widespread tradition, Luke was unmarried and wrote his gospel in Greece at Boeotia, where he died at age 84. Because Luke’s gospel was believed to be an accurate account of the life of Christ, and especially of Christ’s birth, Luke was taken as one of the patrons of notaries. Luke’s is the gospel of the poor and social justice. Trained as physician, St. Luke is also the patron of medical profession. He was reported to have been a fine painter (although this has not been proven), and is also patron of artists, painters, sculptors, craft workers and lace makers. His feast day is on October 18. The symbol for St. Luke is the ox (or bull). This may account for his also being patron of butchers. In art, Luke is represented by a winged ox because he begins his gospel with an account of the priest, Zachary, (Zechariah), sacrificing in the temple. The ox represents Christ’s sacrifice. Copyright © 2019 St. Luke Lutheran Church.